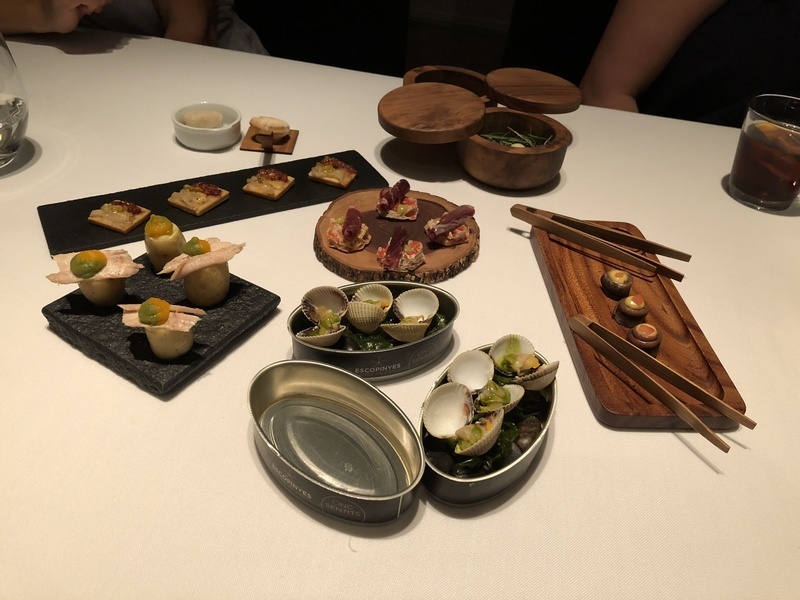 Our dinner after Santa Maria Del Mar was at Cinc Sentits, a Michelin starred restaurant which served an extraordinary tasting menu. This was the only restaurant we got reservations for prior to arriving in Spain and it did not disappoint. 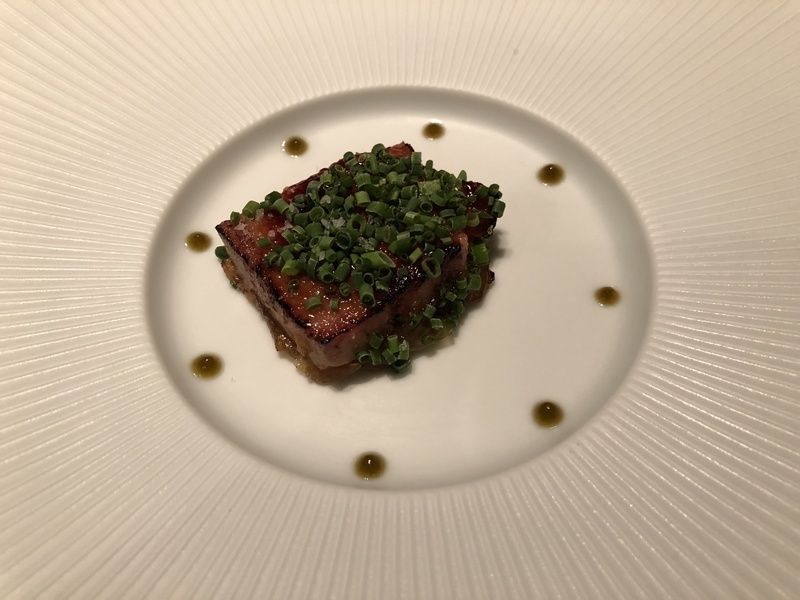 The meal itself lasted almost 4 hours so this is going to be a long post but it's well worth the read and the visuals. The decor was simple and modern but highly refined. The space was small but well laid out so that we never felt cramped. Even before a single dish was served, we knew we were in for a treat. 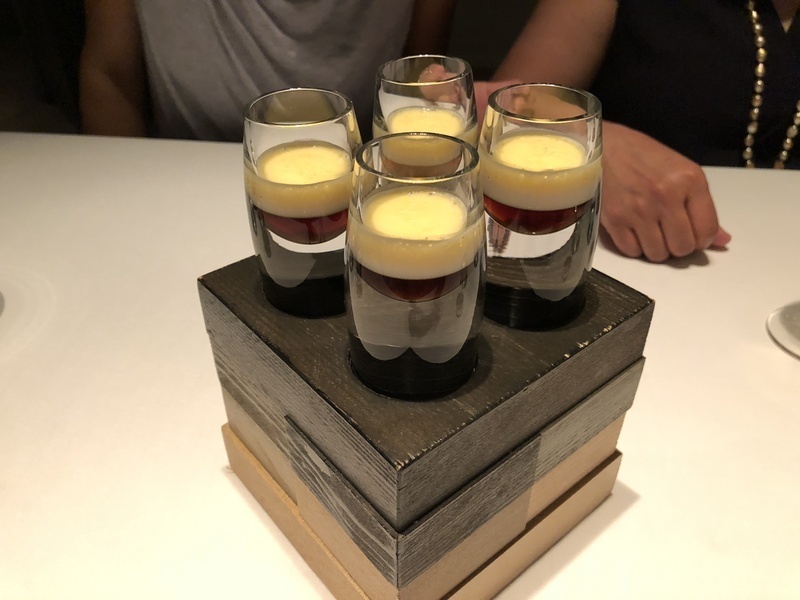 We started with an amuse bouche of maple syrup, cream, cava sabayon, and sea salt. This is a nod to chef-owner Jordi Artal who comes from Canada. Next we had our tapas course which consisted of small bites of familiar tapas dishes. First was anchovy with quince paste, anchovy emulsion, and pickled pepper with a cheese cracker. Next, just shucked baby clams with salsa verde and marcona almonds. Then we had Iberian jamon de bellota on pan con tomate (the best jamon we had on the trip). We then had salt-baked potato with bonito tuna belly and topped with a carrot and green bean puree. This was followed by grilled vegetable flatbreads with olive oil "caviar". The last and most surprising dish were olives two ways. The top light green olive was actually olive puree suspended in a soft olive shell that burst in your mouth, filling it with the full flavor and essence of green olives. The darker green ones below it were manzanilla-arbequina olives with herbs. A great way to start the meal! We moved on to more pre-entree bites. 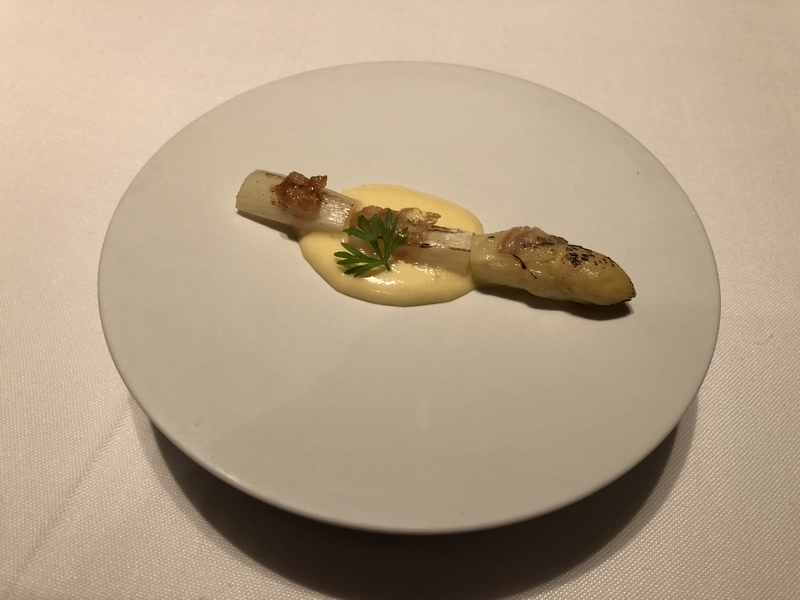 First was white asparagus with Iberian pancetta in a roasted almond emulsion. Delicate but hearty. After that we had a little sandwich called a molette made from shredded beef with smoked bone marrow and black trumpet picada sauce. This little sandwich stole the show for me. The bread was crispy but soft on the inside and the beef/marrow combination was an explosion of flavor. I could have probably eaten 20 of these. 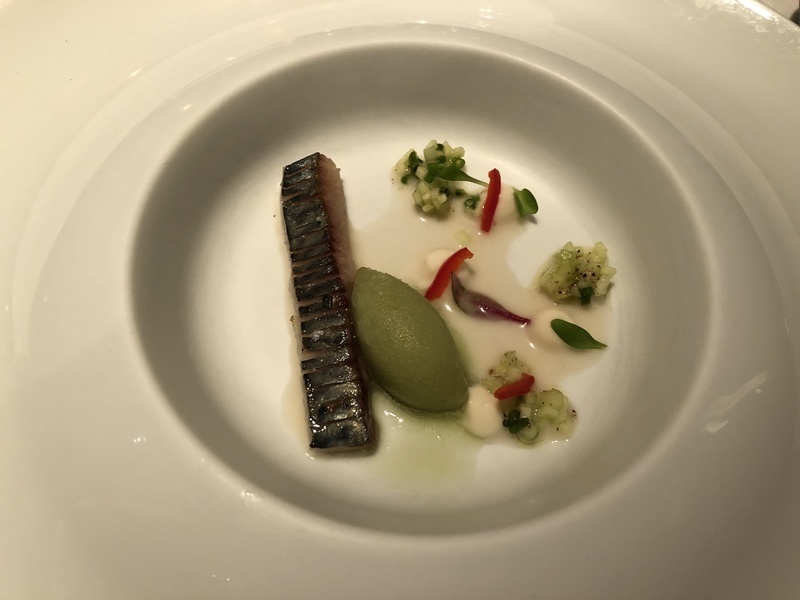 Our first entree was mackerel with cucumber and jalapeno ice cream. It was topped with a cream, caramelized onion horchata. The cucumber and jalapeno ice cream were (as expected) very refreshing and spicy at the same time. The horchata also balanced out the fishiness of the mackerel. Next, we had huge pan seared scallops on top of a sun-choke and onion sauce. Then, a turbot clam beignet with lemon peel, brown butter salsify, and marsh samphire. Being seafood, these were light but full of flavor due to the excellent ingredient combinations. With our seafood entrees behind us, we moved on to the meatier portion of the evening. 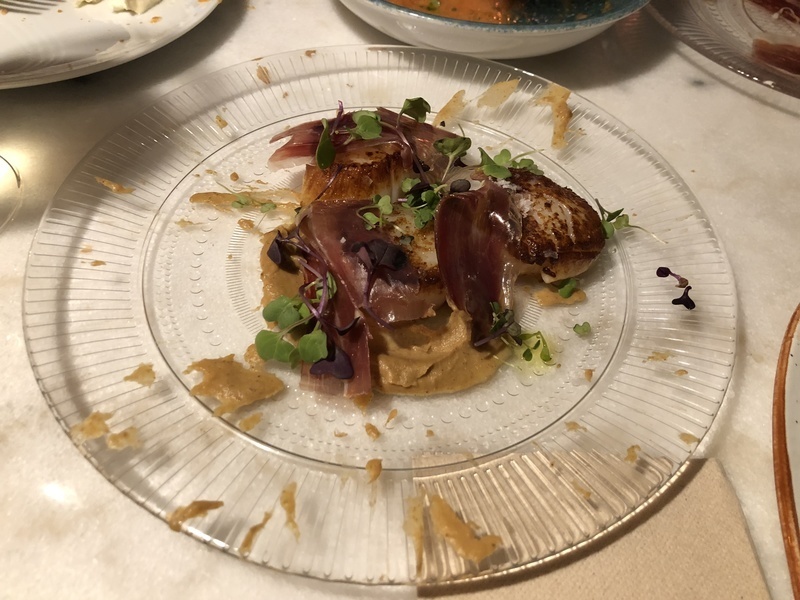 We were treated to a nice hunk of foie gras that was perfectly cooked in a caramelized sugar shell and served with braised leeks and chives. As a mushroom and egg fan, I was delighted by the next dish of roasted and smoked hen of the woods mushrooms with a 63C cooked egg yolk. This was served with thyme-brown butter breadcrumbs and pickled onions. Though there was no meat, this dish tasted rich and full of umami flavor. Keeping with the fowl theme, we ended the meat entrees with duck served three ways. First with sautéed pears and red wine gel, then topped with crushed pistachios, and lastly a Peking style pancake with pear chutney. Each was a small bite which was just perfect for you to get the full taste without getting stuffed, which we were at this point! Of course, dessert couldn't simply be a single dish. We were treated to three artistically crafted dishes. The first was strawberry frozen yogurt with basil and a black currant sauce. Subtle with just enough tartness to balance out the sweetness. 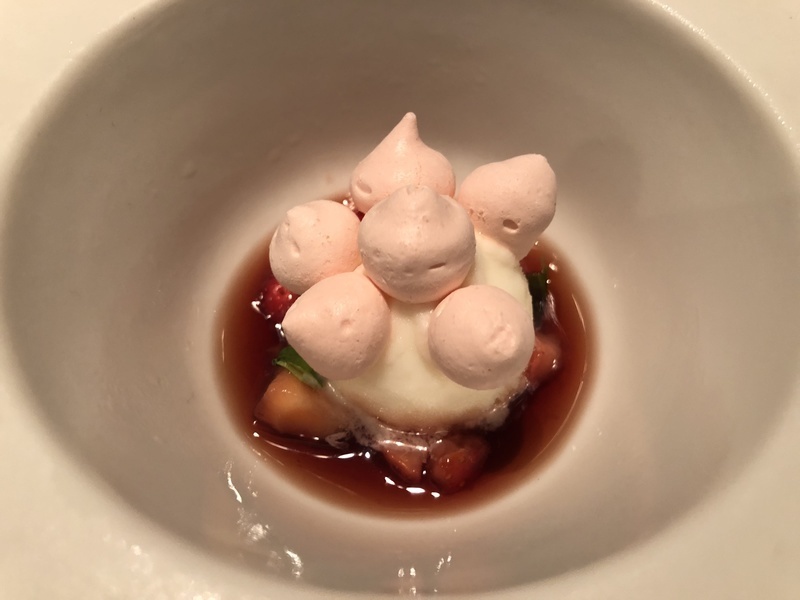 Next was a playful plate of cherries. Like the olives before, these were cherry puree suspended in a soft cherry shell that contained the full concentrated flavor and tart cherries. This was balanced out by cherry "pit" ice cream, candied almonds, and crushed cookies. The final "temptations" were a plate of little bites. There were mini vanilla muffins, thyme meringue with orange and orange blossom macarons, and finally a deeply chocolate truffle with olive oil and salt. A sweet and lovely end to our meal. Not pictured were the wines that were expertly paired with each dish. 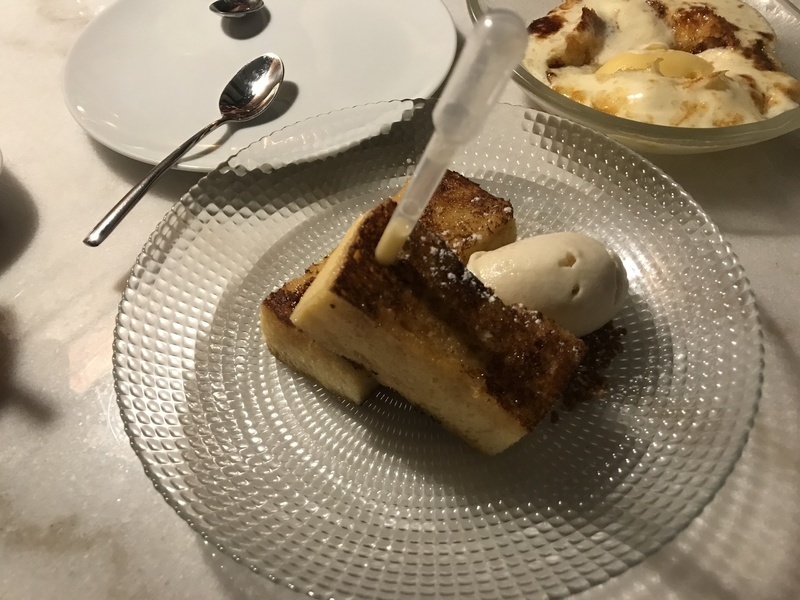 Though there was plenty to drink, the pacing of every dish never had us feeling heavily intoxicated. 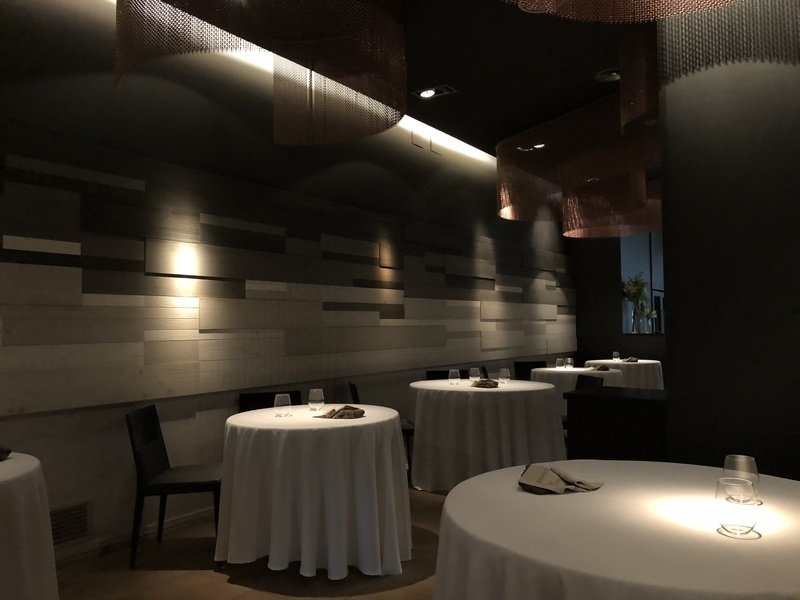 It goes without saying that the service was impeccable, but also thoughtful and quite casual. Even though it was an extremely refined setting, it never felt uptight. The staff was funny and extremely accommodating of us dining with a child at the table. 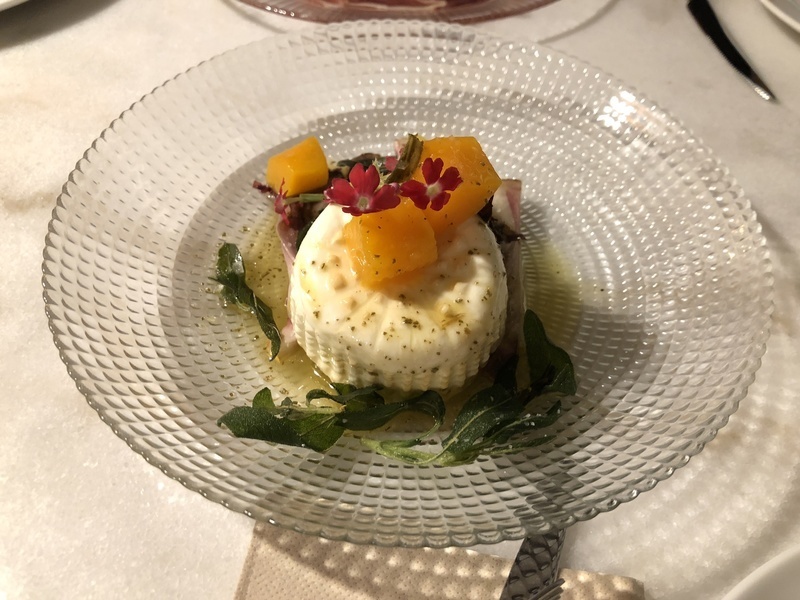 They don't have a separate menu for children but where appropriate, made small changes to the dishes to make them more palatable for a younger person. Easily one of the best dining experiences I've ever had and when we return to Barcelona, we'll be coming back. They'll be moving into another location soon and we can't wait to see what they do in a larger venue. Another day, another historic church. 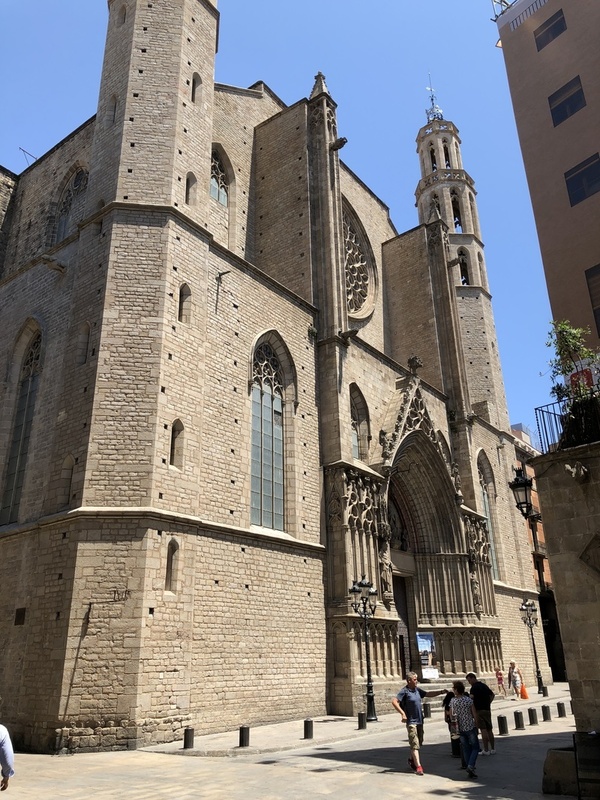 Santa Maria Del Mar was built in the 14th century and was in the part of the city where most of the merchant guilds were located. As such, many of the guilds contributed to the building of this church which they considered their own. As part of our tour, we were able to climb to the very top of the church and get an amazing view of the city. 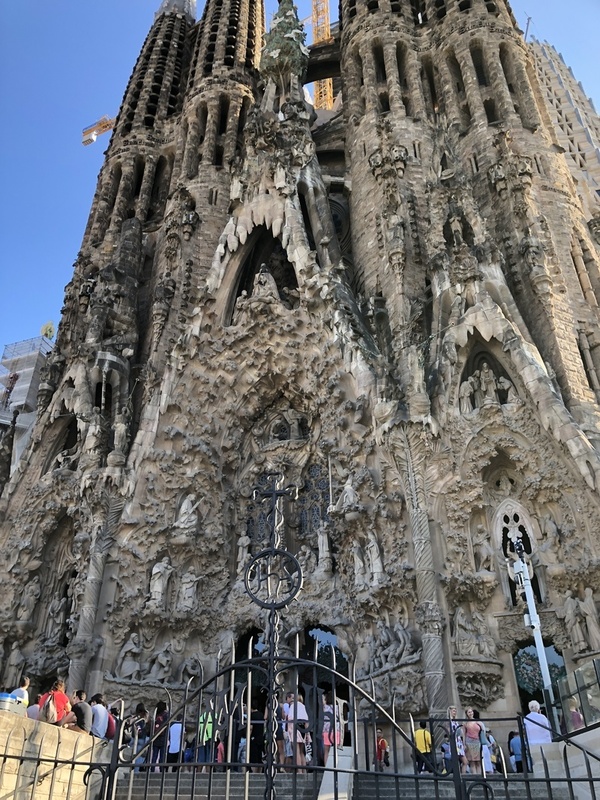 We were finally able to get tickets to see La Sagrada Familia. I won't bore you with too much words. The photos of the church speak for themselves. It was amazing to see it over 10 years after the first time we came to Barcelona. So much has changed and can't wait to see the new additions in a few more years. 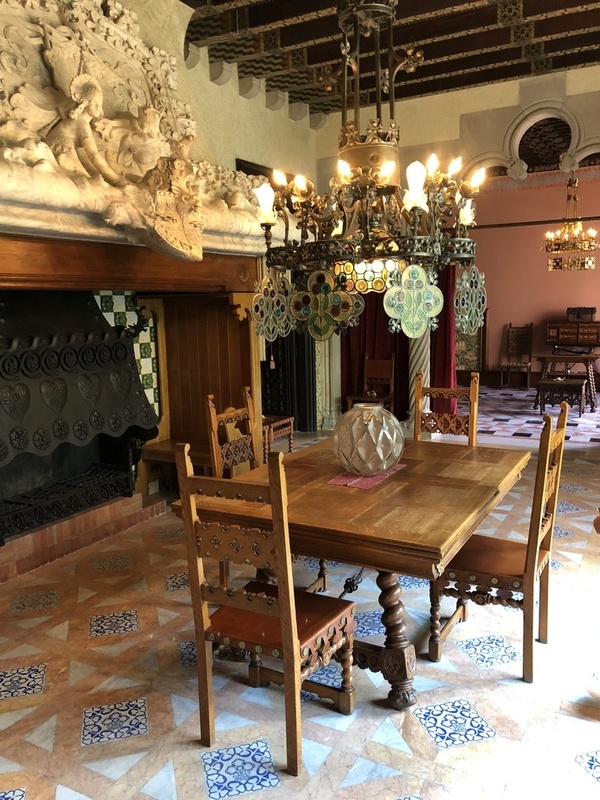 Not far from La Pedrera is Casa Amatller, the former home of chocolatier Antoni Amatller and his daughter Teresa. It's a beautiful building that housed his artwork and showcased the architectural style of the time. The architect was Josep Puig i Cadafalch and similar to Gaudí's Casa Mila, it's in the neo-Gothic modernist style. The house had many cutting edge technologies for a residential house of the time like electrical lights and an elevator! 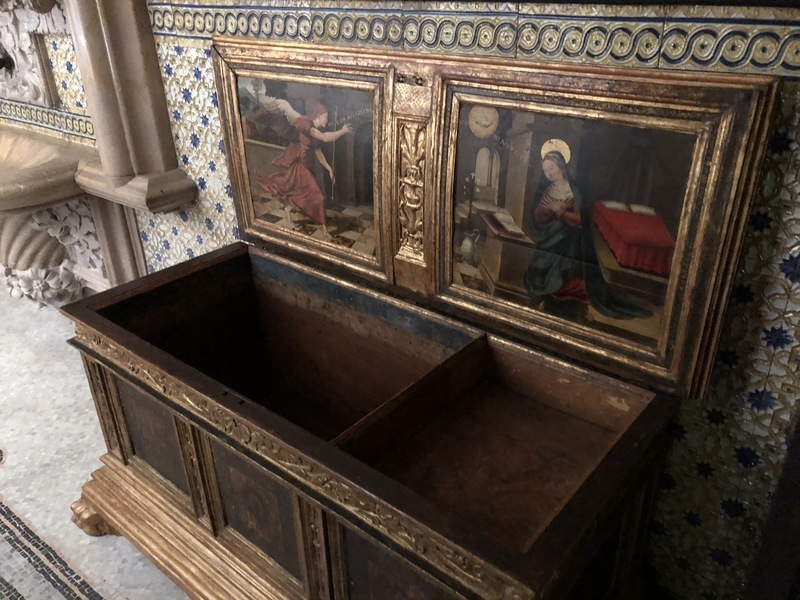 Amatller was a collector of art and antiquities. Many of his acquisitions are still showcased in the house to this day. 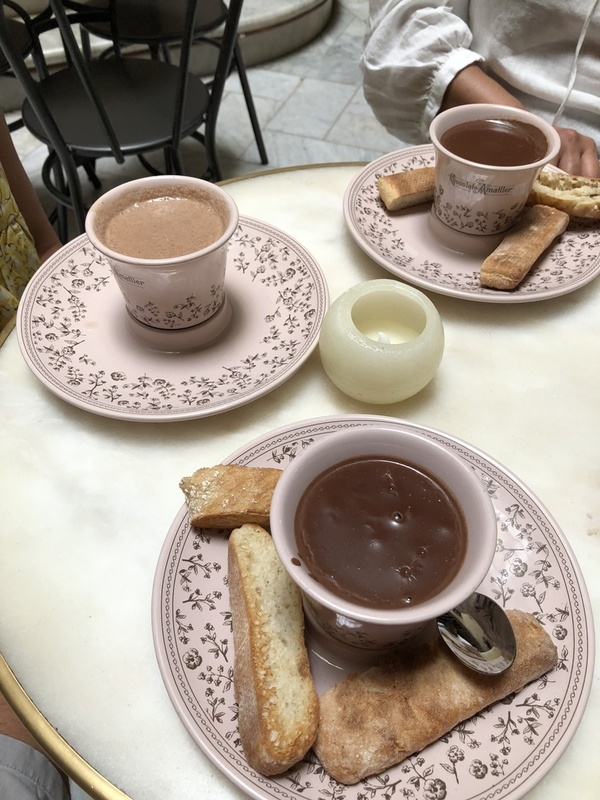 At the end of our tour, we were treated to a cup of traditional Spanish hot chocolate. Thick and rich, it isn't meant as a drink but more as a sauce to dip bread or churros in. We tried both hot and cold varieties which were a nice little afternoon snack.